The color orange defies logic. It's more scarce than other colors and more bold at the same time. And that's why it's beautiful, but most people don't realize this at first. Many people naturally associate orange as a vibrant fruit or vegetable color. It's also associated with Cheetos and bad spray tans. It has many shades and is used on world famous structures like the Golden Gate Bridge. Wait? What? Yes, the bridge with gold in its name that always seems to look red is actually colored "international orange". The beauty of orange is sometimes forgotten because it's a color we only see in large scale for a handful of weeks throughout the year as leaves change in the Fall. Seeing a forest of green turning shades of orange, amber and yellow is so alluring that people will journey just to catch a glimpse of it. That's the power and beauty certain colors have and that's why orange lights can be so intriguing for decorating. Understanding the color of orange light is important because the light halo hues range from gold to amber to red tints depending on the setting. This makes orange a bold color that is suited for contrast. Most people pair orange lights with other colors like purple, green or blue because the contrast isn't just complementary, it's striking. It's so striking in fact that some countries, universities and sports teams have created their entire color scheme around orange. It sits in a color spectrum we typically refer to as Autumn color tones where lighting in yellow, gold, amber and orange hues is popular. At the far end of this spectrum sits the most popular lighting color on earth, which is warm white. Pairing orange light with warm white light is not widely used, however, in combination with yellow/gold lights and green lights it creates the color palette of a changing season and that's why orange lights can be so compelling in these color combinations. People decorate for all these holidays in different degrees, but what's notable about this time span is that the color orange is what ushers us from one holiday to the next. 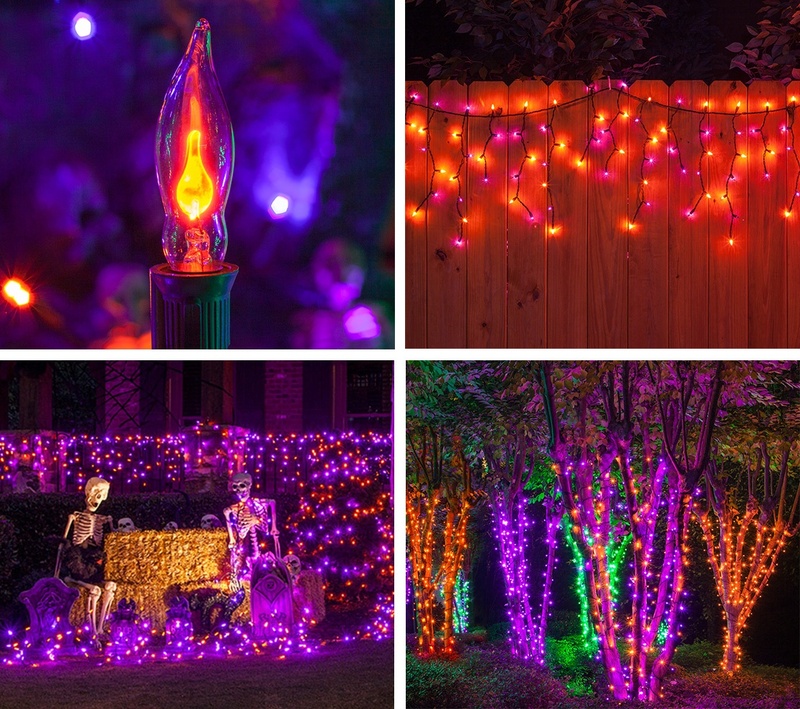 For Halloween, it's very common to pair orange lights with purple or green lights. Then moving to Thanksgiving the color palette changes to orange, amber, gold and yellow. As Winter closes in, those orange and yellow tones move more warm white and then cool white. Notably, warm white or cool white anchor the majority of all Christmas light displays where many other colors get introduced. Humans like color, but sometimes we forget why and don't realize that certain colors are deeply tied to a long history of seasonality that's been happening for thousands of years -- and orange is emblematic of an entire season -- and Cheetos. Not to be outdone by holidays, junk food or fruit, many die hard sports fans and college alumni associate themselves with certain colors for life and orange is very prominent. Case in point, Syracuse University's sports teams are known as the Syracuse Orange, Orangemen and Orangewomen. It's a lot of orange. Many famous college sports programs feature orange including: the Clemson Tigers, Florida Gators, Auburn Tigers and Texas Longhorns. And of course, major professional teams like the Cincinnati Bengals, Cleveland Browns and Houston Astros all feature orange -- and many, many more. 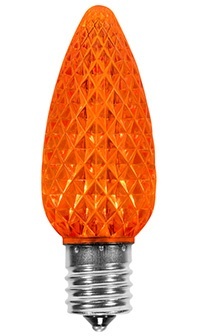 For those that like to show their school or team spirit, decorating with orange lights is easy and it makes a statement. 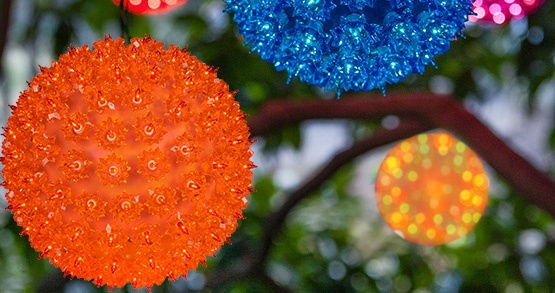 From parties and celebrations to orange light decor used year round -- some people incorporate a lot of orange in their life because it's one of the colors they identify with, and if you can light that color up, it's even better. Orange lights just look good. 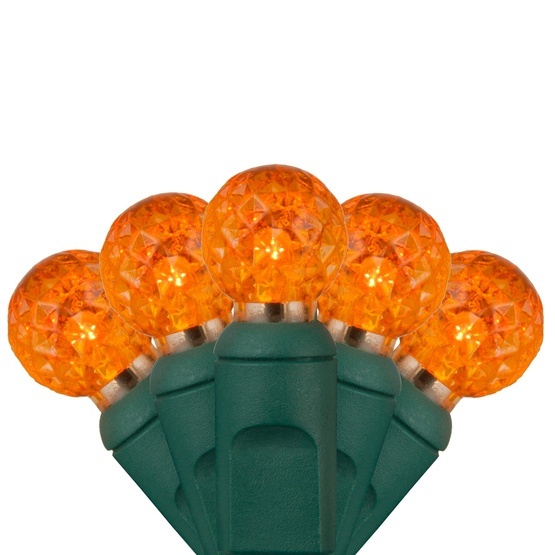 Pair orange light balls with coordinating team colors across the porch or in trees during game day or year round! Orange by itself isn't scary, but when paired with purple or green it can create an electric eeriness that some people love. These color combinations are distinctly Halloween and effortlessly complement one of the season's most used props -- the pumpkin. Whether it was the pumpkin our Autumn colors that gave rise to using more orange in Halloween decorations, no one knows, but orange lights have been there every step of the way. Other than just placing lights around your door or changing out the light bulb on your front porch, there are actually quite a few unique Halloween decorating ideas where orange lights are a key features. Here are some uncommonly awesome Halloween decorating ideas that include a variety of orange light styles. Hang orange and purple icicle lights across your front porch or a fence to create a playful look for Halloween. You could even use a smoke machine or two to create that extra spooky factor! Wrap your bushes in purple and orange LED net lights and project a green X1000 laser light on your yard to grab everyone's attention. 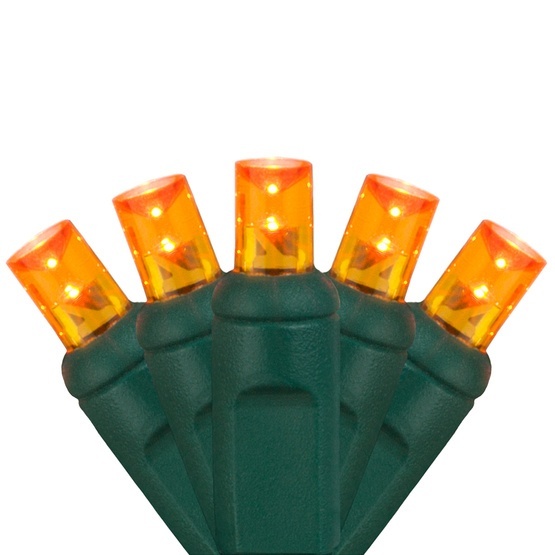 Stake flicker flame bulbs along your driveway or walkway for a simple, clean, and fun way to attract and guide Trick-or-Treaters. Wrap trees with Halloween themed mini light strings to create a spellbinding electric forest. 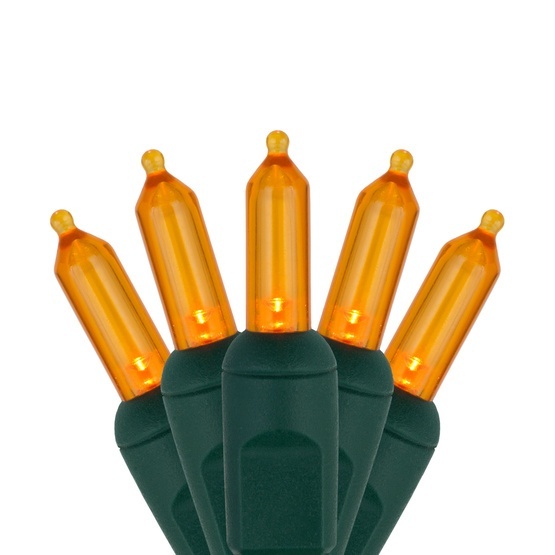 Hang C7 & C9 orange, purple and green lights to cast an eerie glow across an outdoor party or inside a haunted Halloween house. Does it really matter? The color orange is pretty consistent so the choice really comes down to preference over style, price and the size of the display. If you're making a huge orange light themed display and you want to save on power usage, LED lights are always the better option. 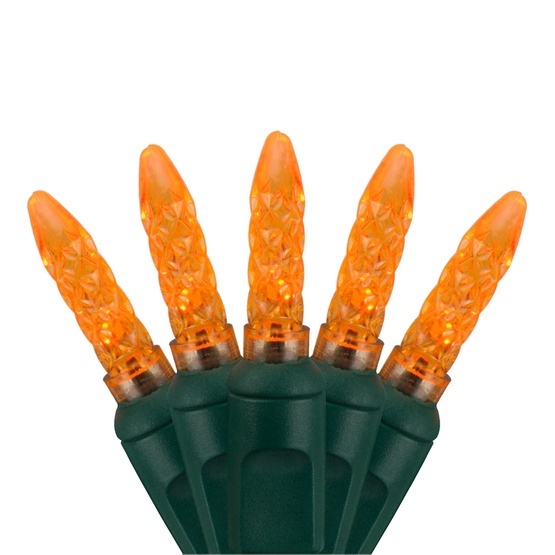 LEDS require far less plug outlets and you can run many together end-to-end to create thousands of orange lights from just one plug outlet. 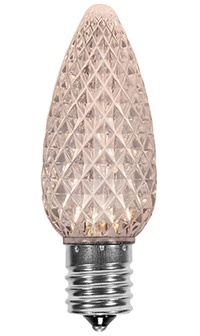 However, if you're on a budget, incandescent orange lights may be a better choice. 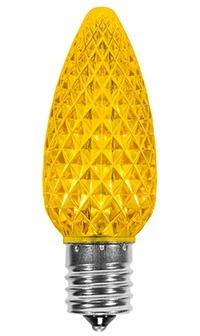 One thing to be aware of in selecting orange lights is that the bulb lens can create different effects and typically there are more styles of bulb lenses for LED lights to create really nice light halos that would make a carrot blush. 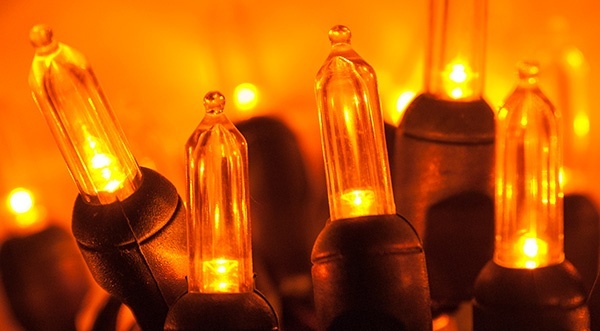 Take a look at the following orange light bulb shapes. If you don't like the color orange, you likely won't be reading this now. 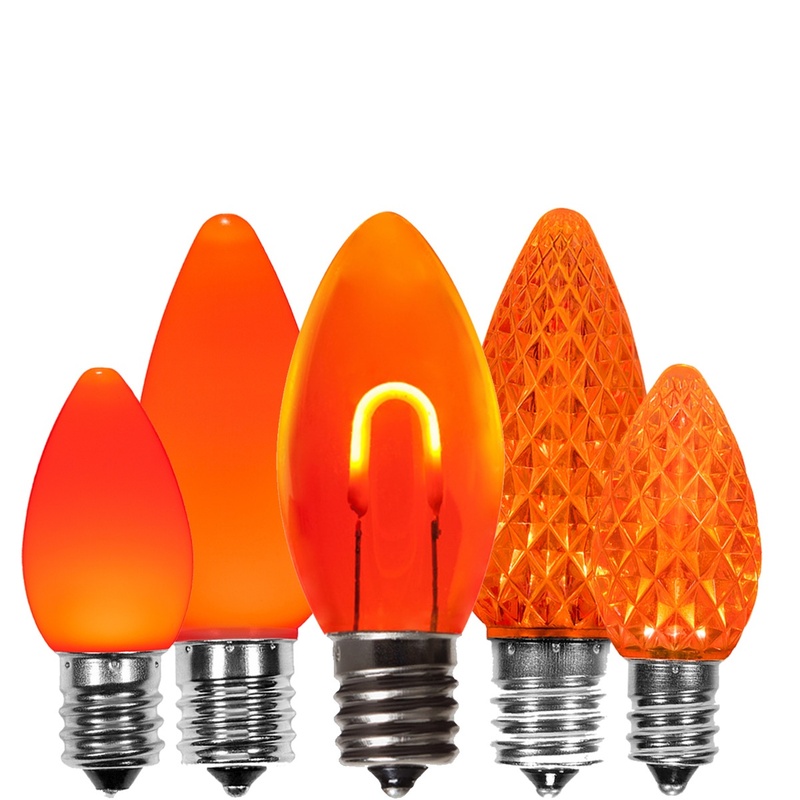 But for those that do and appreciate all the finer points of orange life, we sell nearly 100 different types of orange lighting products. We don't just talk a good orange game, we back it up with a lot of orange light varieties. Why? Because color matters and different people like to decorate different ways for different reasons. 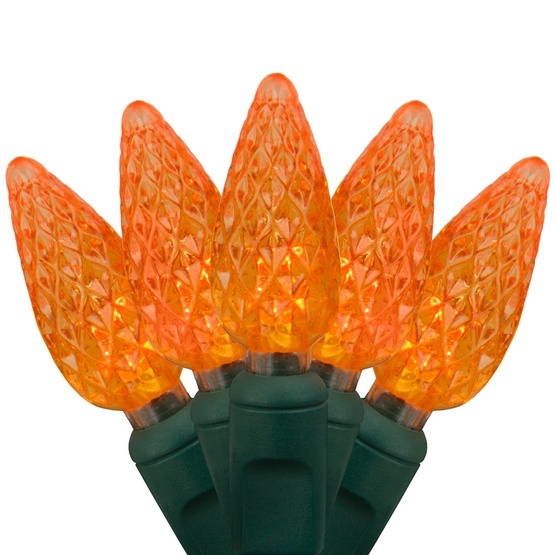 For all the orange lovers out there, these lights are made for you. Go forth and make awesome displays. We got your back!